Continuous technological developments have had a profound impact on healthcare. From individual experiences to operational efficiency, technology has transformed the industry for both patients and medical professionals. With an increase in data availability, a transition to ePHI, and the necessity for updated technology, proper IT support has never been more necessary. For the small and medium-sized practices, managing the daily responsibilities and technical necessities can often be too much to handle. 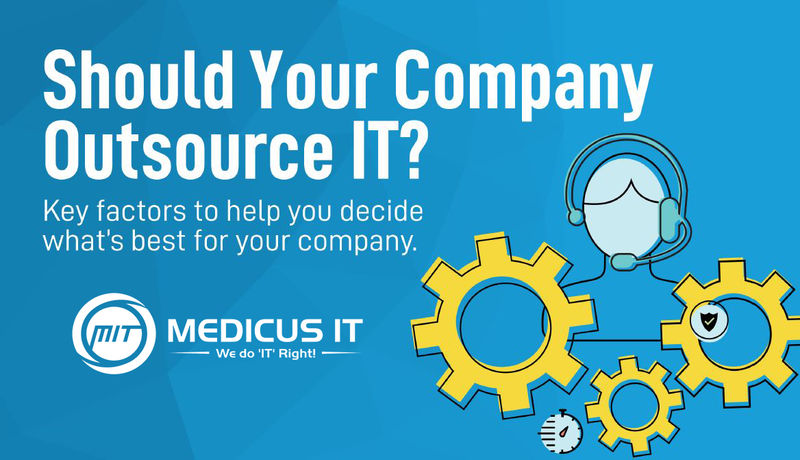 Outsourcing your IT support with Medicus IT can ensure your practice operates securely and efficiently, allowing you more time to focus on your patients. Here are some of the tops reasons you would look to outsource with Medicus IT. Medicus IT is the leading healthcare IT service provider in the Southeast and is a recognized top 5 healthcare specific MSPs nationwide. With more than 100 years of collective and exclusive industry experience, we know how a healthcare office operates and what technology is needed to optimize practice workflow. Our experience also enables us to triage and prioritize your technical issues appropriately to provide you an unparalleled response time. We also hold an intimate knowledge of all HIPAA regulations, providing you confidence in your compliance. One of our experienced engineers will complete a free network assessment and provide a consultation, recommending proper HIPAA security solutions as part an overall cybersecurity approach to maintain the integrity and confidentiality of your medical records. Outsourcing your IT means you have access to a multitude of expert-level resources when you need them most. Around-the-clock support also ensures your IT systems remain operational, available, secure, and compliant at all times. After-hours support allows you to focus on the everyday demands of your patients and practice. Most IT companies charge by the hour, but Medicus IT charges by number of devices being supported. Our flat fee pricing model gives you confidence and freedom to use our support services without accruing additional charges. Paying by the hour can cause uncertainty with your monthly bill and even a lack of utilized support services to avoid extra fees. With Medicus IT, you can expect to pay the same amount every month regardless of the hours worked to provide you proper service. With an outsourced service like Medicus IT, you have access to the most advanced security, support, and technology available. We also provide you resources and manpower that offer a higher and more dedicated level of service, which can be difficult to create and afford internally. From software and hardware products to onsite support and monthly reporting, we are an all-inclusive support resource for any healthcare practice. Still not sure if you should outsource your IT? Contact us for a consultation and free network assessment.